SMOLENSKI, Nikola and TRTOVAC, Aleksandra and DAKIC, Natasa and ANDONOVSKI, Jelena and SOFRONIJEVIC, Adam (2017) Adding value for society by efficiently presenting cultural heritage with minimum additional costs: In-house development of digital tools for searchable collections at University library Belgrade. 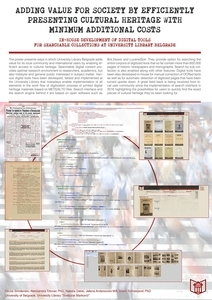 Paper presented at: IFLA WLIC 2017 – Wrocław, Poland – Libraries. Solidarity. Society. in Session 112 - Poster Sessions. 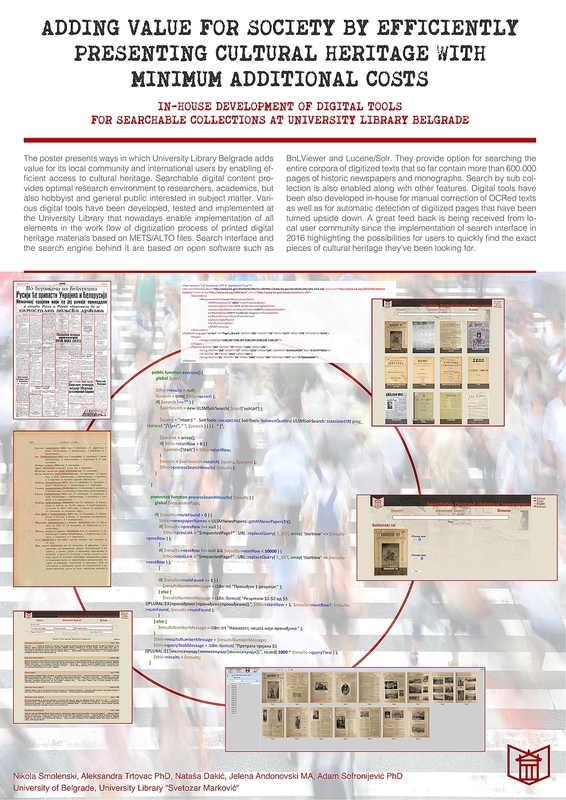 The poster presents ways in which University library Belgrade adds value for its local community and international users by enabling efficient access to cultural heritage. Searchable digital content provides optimal research environment to researchers, academics, but also hobbyist and general public interested in subject meter. Various digital tools have been developed, tested and implemented at the University Library that nowadays enable implementation of all elements in the work flow of digitization process of printed digital heritage materials based on METS/ALTO files. Search interface and the search engine behind it are based on open software such as BnLViewer and Lucene/Solr. They provide option for searching the entire corpora of digitized texts that so far contain more then 600.000 pages of historic newspapers and monographs. Search by sub collection is also enabled along with other features. Digital tools have been also developed in-house for manual correction of OCRed texts as well as for automatic detection of digitized pages that have been turned upside down. A great feed back is being received from local user community since the implementation of search interface in 2016 highlighting the possibilities for users to quickly find the exact pieces of cultural heritage they’ve been looking for.